My next event will be the Samhain Avalon Faery Fayre and Ball this October. The Avalon Faery Fayre and Ball is held twice a year in Glastonbury, once in the Spring and once in the Autumn. I will be at the Fayre with my books and products in Glastonbury Town Hall and I will also attend the Ball on Saturday evening! After having such an amazing time at the Spring Avalon Faery Fayre I am sure this event will be just as wonderful! 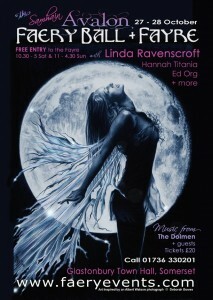 To find out more about the free Faery Fayre or to buy tickets for the Ball visit www.faeryevents.com.